Los Angeles has me addicted to international supermarkets. The market I go to has it's ups and downs. On the up side, I'm able to find produce that is budget friendly. I'm talking about peaches and plums at two pounds for 99 cents. While the quality of this produce isn't organic or top notch, it's really not much different than something I'd find at a standard grocery store. Of course, a price still comes with discount peaches. That is, navigating through isles crowded with carts filled past the brim, being rudely pushed from behind by an impatient elderly woman's cart, and standing in line for 20 minutes to buy three items at 11am on a Tuesday morning. Lets just say I don't always choose the right time of the day to go grocery shopping here. Even so, I keep returning for more of this madness. It's all for you, sweet peaches (I have a special place in my heart for stone fruit). These waffles were made at impulse on a slow Sunday morning. I was having trouble deciding if I felt like making waffles or going out to have someone else make me waffles. As usual, I decided to make use of the ingredients I had in my apartment. So I made my own waffles with the peaches I fought so hard for at the supermarket down the street. Make the flax egg by combining flax meal with water. Stir with a fork and set aside for 10 minutes. Combine oat flour, baking powder, ground cinnamon, and salt in a large bowl. In a separate bowl, mix the coconut oil, almond milk, vanilla, and the gelatinized flax egg. Whisk the wet ingredients into the dry until well incorporated. Dice the white peaches, leaving 1/4 uncut for the topping. Then, fold the diced peaches into the batter. Let the batter rest for 10 minutes; meanwhile, plug in your waffle iron and turn it on to medium-high heat. Spray the preheated waffles maker with pan spray and pour the waffle batter into the iron. Cook according to your waffle iron's directions. 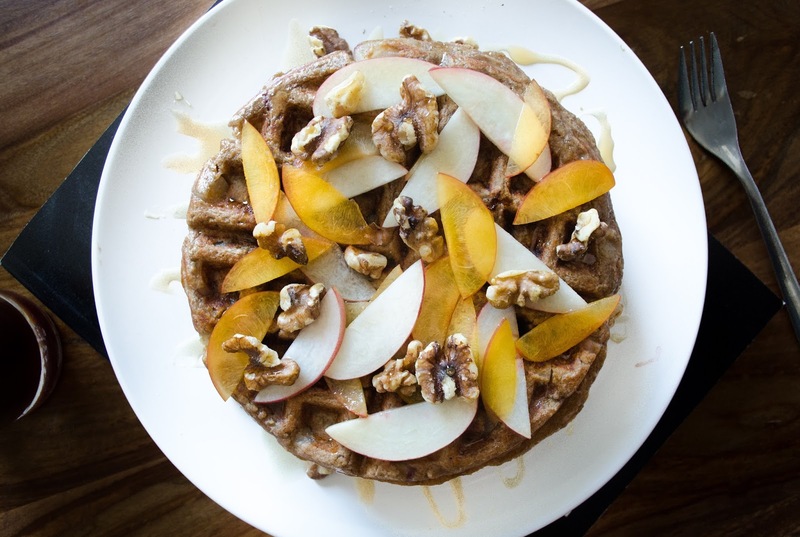 While the waffles are cooking, toast the walnuts in a skillet over the stove for 2-3 minutes. Next, slice the plum and reserved white peach for topping. 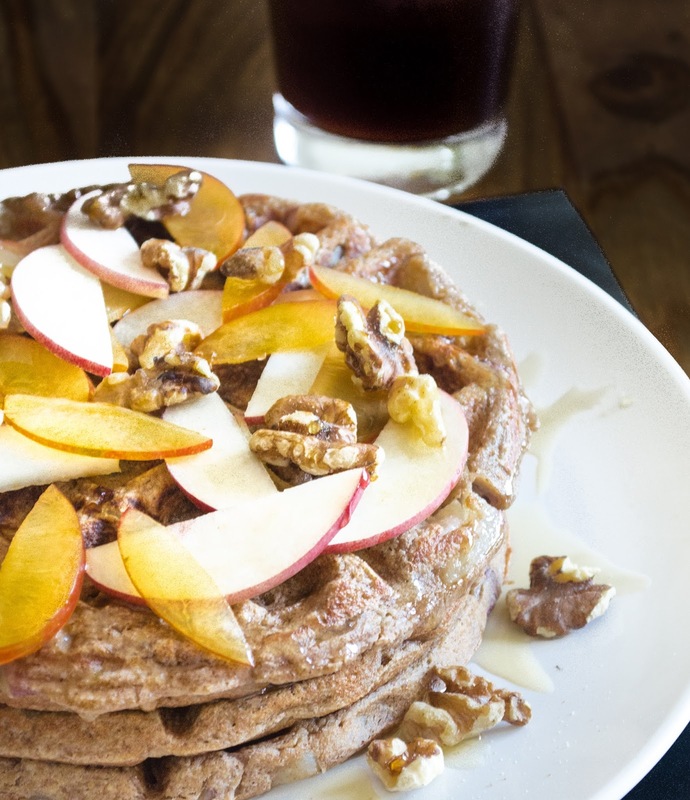 Stack your waffles, top with sliced peaches and plums, and sprinkle toasted walnuts. Lastly, drizzle with maple syrup or honey and enjoy! *I made my own oat flour in a food processor. To do this, just grind some (gluten-free) rolled oats into a powder. One cup of rolled oats makes about one cup of oat flour.